"Fresh Baby supports parents with simple and natural solutions to reducing a child's risk of obesity by promoting the development of healthy eating habits from the first bite of solid foods. The recipes included in the books, newsletter and online were developed to be convenient for anyone... it is clear that parents play a crucial role in getting their children off to the right start. 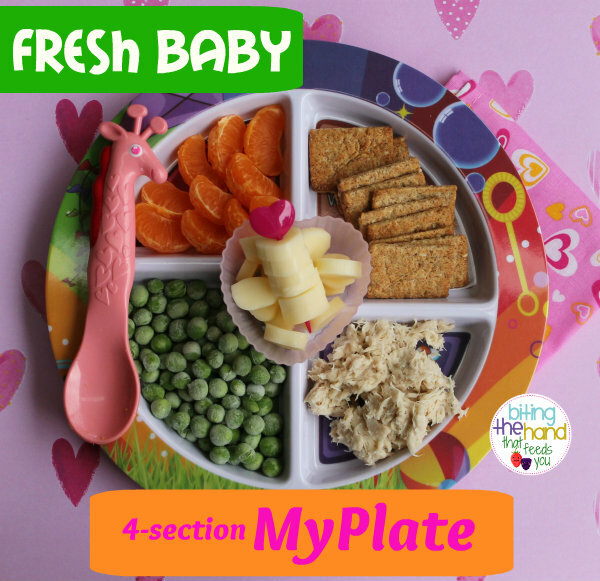 Fresh Baby was founded, and continues to operate, on the belief that all parents want to raise healthy children..."
The Fresh Baby My Plate was designed from the USDA's switch from the Food Pyramid to the MyPlate system, which advises that half your plate be fruits and vegetables (heavier on the veggies,) and the other half whole grains and protein. 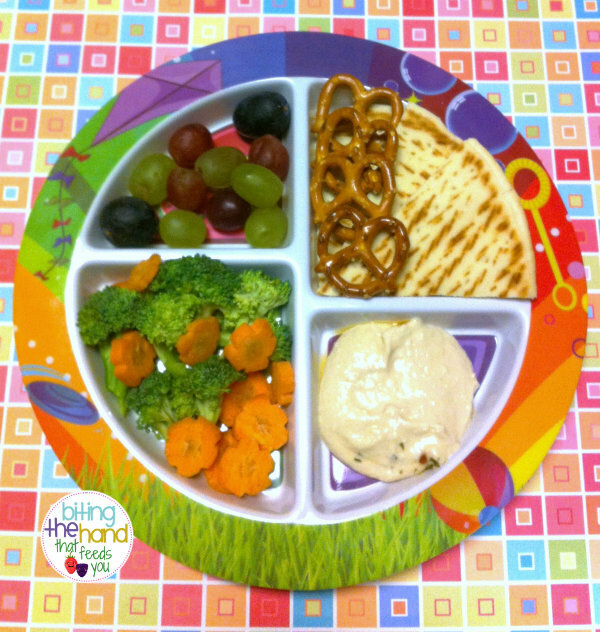 The graphics were designed to be colorful and fun, and inspire with healthy food choices and activities. 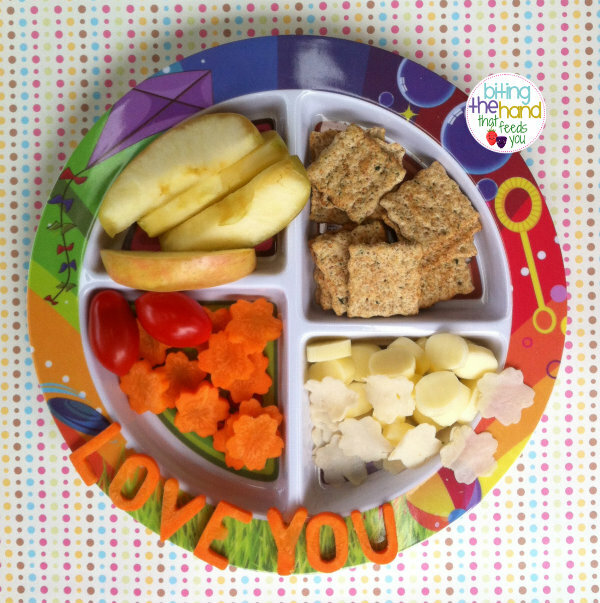 Helps Mama remember to include more than just one or two food groups in a meal. And that HALF of it should be fruits and veggies! Colorful - studies show that kids prefer meals with six different colors! And while we can't always manage it with the foods at every meal, we can cheat sometimes with the dishes and accessories! 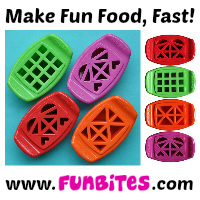 Easy to wash - dishwasher safe! And if you're stuck hand-washing, the curved corners are easy to wipe clean! 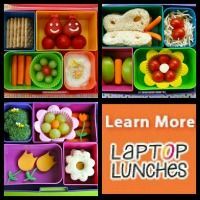 If you choose multiples of these to use for several meals or several kids each day, they stack nicely. Lead, BPA, and Phthalate free! I'm not in love with the graphics. They're a little busy and confusing for me. I'd prefer abstract or patterns. The "Dairy" serving is separate. Either in the cup (available with the My Plate Dinnerware Set) or in a separate dish (for milk or yogurt.) Or you could balance cheese on the rim. Unless you like washing dishes after every meal, you'd need several of these - at least one for each meal. But they stack! Couldn't really think of anything I didn't like about it. Oh, they're not microwave safe. But none of the melamine dishes are. 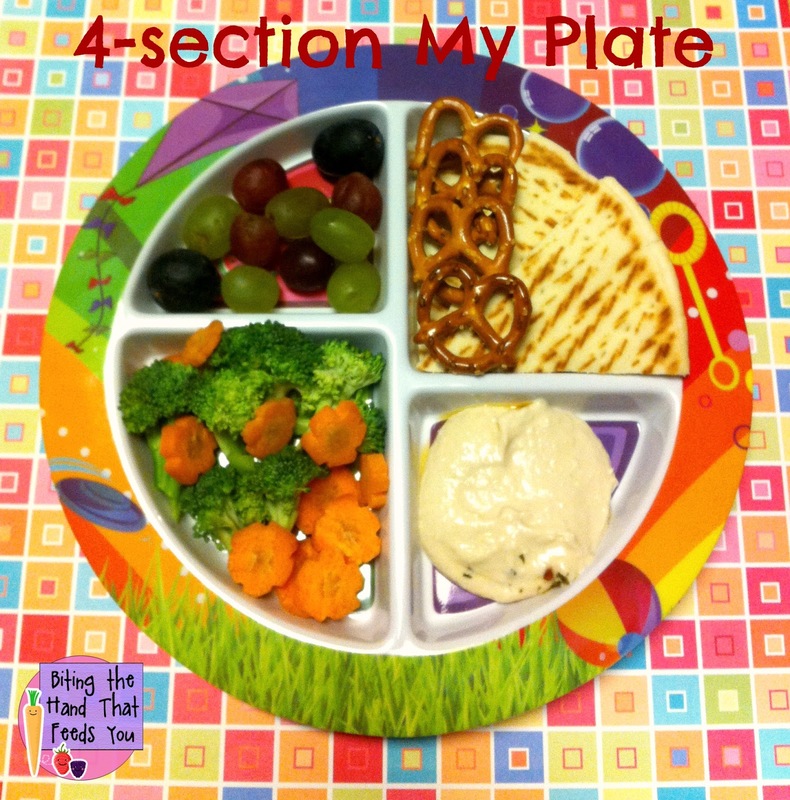 Z loves segmented plates of any kind, since they remind her of her "beautiful lunches" in the boxes. So she's a fan. Plus I tend to pull out a greater variety of foods and food groups versus on a regular plate. Which makes me a fan too. Anything to remind and motivate me to serve more balanced meals is always a plus! 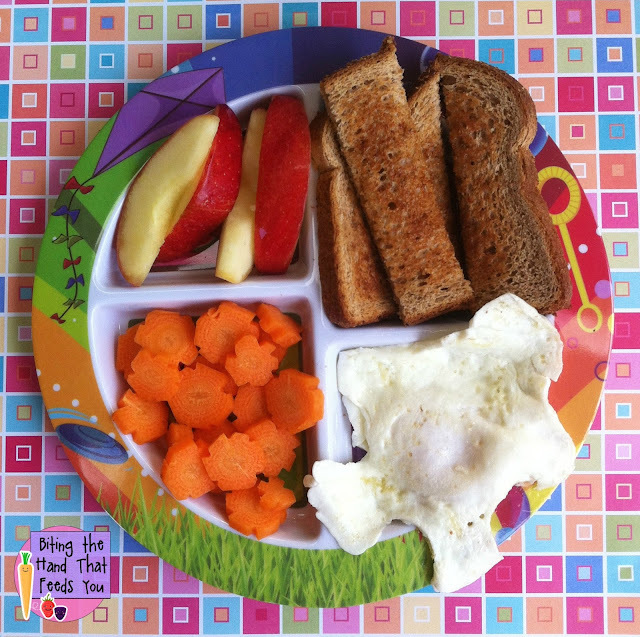 The Fresh Baby My Plate is a great addition to our segmented plate collection, and a great reminder to serve more fruits and veggies throughout the day. And on days where we don't have school, so I don't need to pack a lunch. 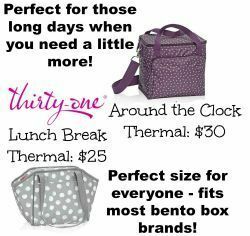 For me, segmented lunch boxes and dishes help challenge me to find more food options, to fill in all the spaces. I do much better when given a goal or theme or challenge. And the prize is a healthier child. Everyone wins! They also have a Baby My Plate and My Plate for Adults! 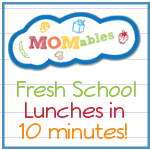 Fresh Baby offers a host of free resources as well, to help parents offer their kids healthy choices. You can get free recipes online, as well as in their e-mail newsletter. Disclaimer: I received the Fresh Baby My Plate Dinnerware Set and So Easy Toddler Food Cookbook (also available for Kindle) to review. What a neat plate! It is a great visual for the child.